It’s that time of year when all of the woodsy wisdom, myth, fact, fiction and wive’s tales about morel mushroom hunting make their way into conversations. Whether you are seasoned mushroom hunter or new to the chase, here in Indiana the morel mushroom season is part of a culture that cherishes the hunt as much as the mess of mushrooms frying in a pan. Spring must be in the air to find morel mushrooms. As the early season flowers make their way out of the forest floor, all signs point to the start of the season. Take note of the trees that are budding! Whether you hunt near elm trees or fallen trees, mid to late April is typically when you’ll notice mushroom hunters recant tales of the holy grail they once found in their secret spot. Moist soils are a key ingredient to finding morel mushrooms in the woods. The seasoned mushroom hunter can often be found in forest areas where good drainage and sunlight go hand in hand. The spring rains should lift your spirit in anticipation of the great bounty of mushrooms that will soon be popping out of the ground! In Indiana we often find that sandy soils and clay loam soils are indicators of morel mushroom areas. Another sign of the season is the gobbling of wild turkeys. While your mission may be to find that mushroom score of a lifetime, it’s just as enjoyable to be serenaded by gobbles, clucks, and the dance of wild turkeys. A bag full of gourmet mushrooms is certainly top of mind, but the simple pleasures of spring time in woods of Indiana is a feeling you’ll never forget. Much has been written about ideal soil temperatures and many mycology experts tend to agree that 45 – 55 degrees F is an ideal temperature for morel mushrooms. I make no claims to be an expert, but when mid-April rolls around and it’s t-shirt weather…I believe we are on to something. In 2014, I found my first mess of morel mushrooms of the season in late April (the 23rd to be exact) and continued finding them on into mid May. This is a shout out to Mom’s and Mother Nature! As Mother’s day falls on May 14, this is a great time to combine family time with an adventure for morel mushrooms! Yellow morels (Morchella Esculenta) are often at their peak during the 2nd and 3rd weeks of May, and what better way to supplement Mother’s day dinner than with gourmet mushrooms?!? May is often considered the best time of the year for yellow morels in Indiana. Whether you own a wooded / recreational property in Indiana or simply have permission to go out on the family farm, we want to help you get started on a great mushroom hunting season in 2017! 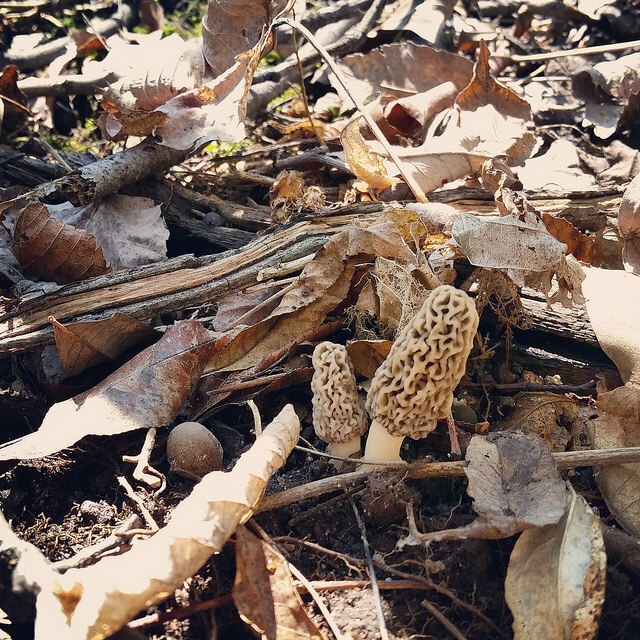 We’ll do our best to sort facts vs. fiction so you can get a better idea of when the best time and where the best locations for finding morels in Indiana are at. Some people enjoy the hunt more than the mushrooms themselves (in fact these are the folks I prefer going to the woods with 🙂 ) and this is a major part of the experience. For me, it’s about getting out into the woods, breathing in the fresh air, clearing the mind, and spending quality time with family & friends – adding a full sack of mushrooms is the icing on the cake. For many mushroom hunters, this time of year is equal parts tradition & folklore, and as the season takes shape I look forward to the campfire stories being retold from seasons past. If you are looking for a place to hunt mushrooms, NICHES Land Trust properties and preserves are open to the public from Dawn to Dusk. I wish you the best with the 2017 Morel Mushroom season and when you get a chance, let me know where you found that bag full of them last season, thanks! We specialize in wooded property in Indiana where you can hunt morel mushrooms in season! In 2016 we sold over 400+ acres of Indiana wooded land that were prime morel mushroom hunting spots! If you are looking for 10 acres, 20 acres or even hundreds of acres to hunt, recreate or build a home or cabin, on…call Your Land Man today!